Electrophilic Aromatic Substitution reactions are one of the more fun topics that you will study in Organic Chemistry. But perhaps you find it tricky due to the sheer volume of information that makes up the big picture. 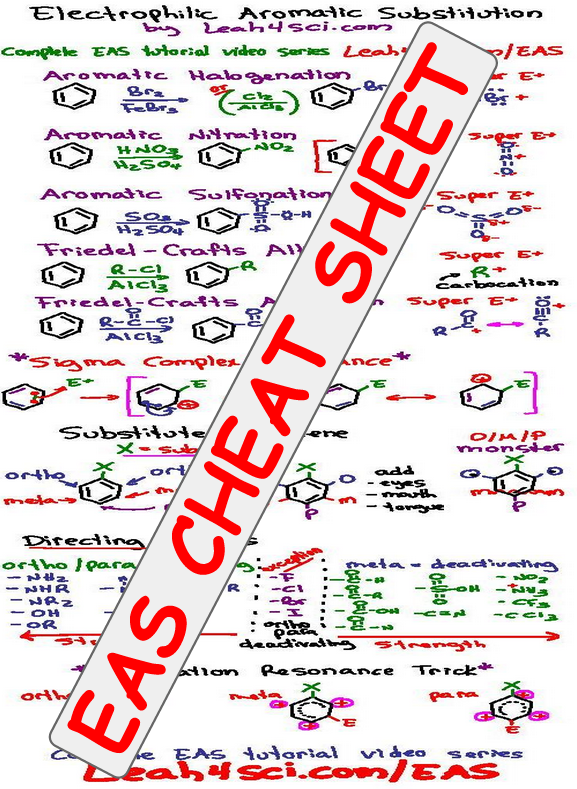 And so, in addition to my EAS Tutorial Video Series I’ve put together a thorough EAS cheat sheet. Click the image for a high resolution copy, and print one each for your textbooks and notebooks. What does the O/M/P Monster say? Ch O-M-P!! I can’t get this out of my head now! HAHAHA that’s awesome Bianca! Never thought of that! Perfect! Thanks so much! I was pretty sure I was going to flunk my org test,this is a lifesaver! awesome! glad to help you pass your exam. Good luck! Thank you for sharing Janet. Glad it’s helping. Are you in a summer orgo course? Amazing!!! THANKS FOR YOUR BIG HELP!!!! I will surely pass this subject because of you. Glad to hear that Pat. When is your exam? Thanks Brittany. I chose to focus on the most common reactions for this. Which additional reactions were you looking for?